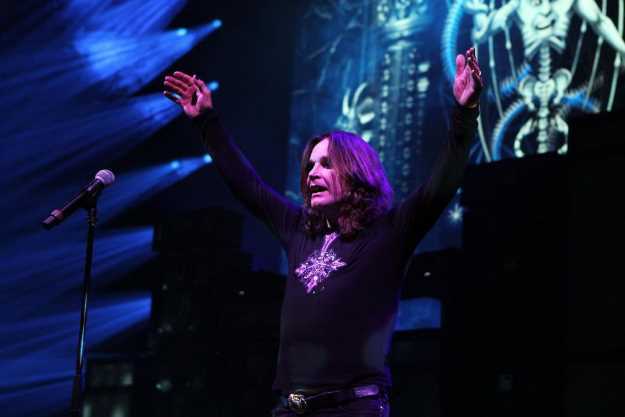 When singer Ozzy Osbourne announced the dates for his No More Tours 2, his PR firm issued a press release that emphasized it was simply "the end of global touring" for the Prince of Darkness. In other words, he might not tour the world anymore, but he'd still play "select live shows." Performing last night in front of a capacity crowd at Blossom, Osbourne, who took the stage wearing a flowing purple robe, maintained it wasn't goodbye. "It's not my farewell tour," he said early in the nearly two-hour set. That might be the case, but it certainly felt like a farewell as Osbourne capably revisited his past and played hits from both Black Sabbath and from his solo career. It was the last concert of the season at Blossom. We'd normally post a slideshow of photos from the concert, but local photographers weren't allowed to shoot the show. Throughout the show, Osbourne, 69, never ventured far from the microphone stand, which seemed to help keep him upright. Given his age and the toll that drugs and alcohol have taken, it's hard to imagine he'd come to Northeast Ohio again, something that wasn't lost on the enthusiastic crowd that showed up for the gig. If last night indeed represented Osbourne's last show here, the man went out with a bang. He and his five piece-band that included guitarist Zakk Wylde, bassist Blasko, drummer Tommy Clufetos and keyboardist Adam Wakeman delivered the set-opener, "Bark at the Moon," with some real aggression. Osbourne even ended the tune with a piercing howl. Osbourne and Co. also really ripped into the classic Sabbath tune "Fairies Wear Boots," a song that found Osbourne looking as if he were conjuring evil spirits as he held his hands up to the sky and frantically shook them. Osbourne described the sludge-y "Suicide Solution" as a song about his battle with the bottle and picked up a water gun toward the track's end to douse fans sitting in the front row. "Road to Nowhere" came off as a generic power ballad, but the band got back on track for "War Pigs," a tune that started with the sound of blaring sirens. During its epic conclusion, Wylde, who, with his bushy hair and beard looked like some kind of Viking hero, made his way to the back of the pavilion to solo. He played guitar behind his head and even took to biting the guitar strings with his teeth at one point. The thrilling "War Pigs" finale would bleed into a medley of instrumentals that in turn led to a lengthy drum solo. Osbourne returned to the stage for "I Don't Want to Change the World," a tune that had a bit of a garage rock sensibility, and the poppy "Shot in the Dark," a track that didn't hold up over time and sounded very dated. The set concluded with the riveting "Crazy Train," a song that had fans singing in unison from the very first notes. The encore included the power ballad "Mama, I'm Coming Home," another track that just hasn't aged very well. In the past, Osbourne has had trouble remembering the words to the songs and struggled with his voice. Last night, he sounded coherent (though his accent sometimes made it difficult to understand what he said between songs) and his voice sounded solid, especially on the tracks that didn't require too much singing. The concert might not have been a true farewell, but if it was, Osbourne left on a high note.